Amidst Olympic Trials, with Olympic Club (US Open) in the background and the London Olympics awaiting us, there is no better time to take a look at the year that was for all Olympic sports for Clemson. This includes every sport besides football, baseball, and men’s basketball. Coming into this year, expectations were high for a few programs: women’s tennis & volleyball along with the annual expectations of the men’s golf program. But most importantly, this year signaled the end of the men’s and women’s swimming programs and the men’s diving program. Neither had huge expectations, but both were hoping to go out with a bang. In the end it didn’t work out quite as well as hoped as the men’s swimming and diving program finished 5th in the ACC while the women finished 7th. But to have two programs ending as the highlight of your Olympic sports program says more than it should. It says there wasn’t much else to remember. Total, across all Olympic Sports there were two ACC Championships, both by the same squad – Women’s Track & Field (Indoor & Outdoor). 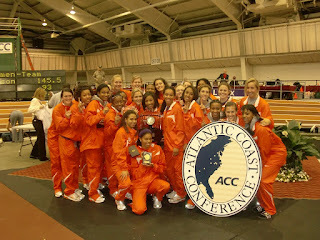 The Women’s Track & Field Team also represented the only two Top5 national rankings produced by the Athletic Department. Well done ladies! But it’s not the lack of overall success that makes the season disappointing, it’s the performance of the historically strong programs. Men’s golf & soccer have three national championships among them and women’s basketball & soccer have been perennial Top 25 programs. This year, golf finished 4th in the ACC and failed to advance out of the regional while soccer finished at .500, was bounced in the first round of the ACC Tournament, and not invited to postseason play. The good news from these two programs? The golf team won back-to-back tournaments, sent a player to the Masters and the Heritage, and went 2-1 head-to-head against USC while the soccer team defeated USC along with #1 Maryland. As for women’s basketball and soccer? Both lost to USC and finished last in ACC play. The good news is both made strides this year. The bad news, they were worse last year. Women’s rowing was again solid with a runner-up finish in the ACC to national champion Virginia and finished with a Top 20 national ranking. Women’s volleyball didn’t quite meet expectations, but finished 5th in the ACC and defeated USC. Overall, the Olympic sports programs at Clemson went 2-4 against USC, though I would imagine it would be better if you count multiple entry events like golf, track, & swimming. But as I mentioned, all was not lost for the year. The swimming and diving teams finished their program with class, women’s track won two ACC Championships and finished in the Top 5 nationally, and women’s rowing finished 2nd in the ACC and 20th nationallay. I’m no fan of USC or UGA. Never have and never will be. But I’ve also never really respected them. Never have. But I can’t say I never will. Because there are two guys that are slowly changing my perspective on respect. Two guys with serious results who are doing things the right way. And they’re good guys to boot. But if it were only success that is making me change my mind, this list would include Les Miles and Nick Saban and Bob Stoops and Frank Beamer. But success is only one piece of the puzzle. It also has to do with how they carry themselves, handle their families, and respect their players. It has to do with how they represent the University and their alumni. 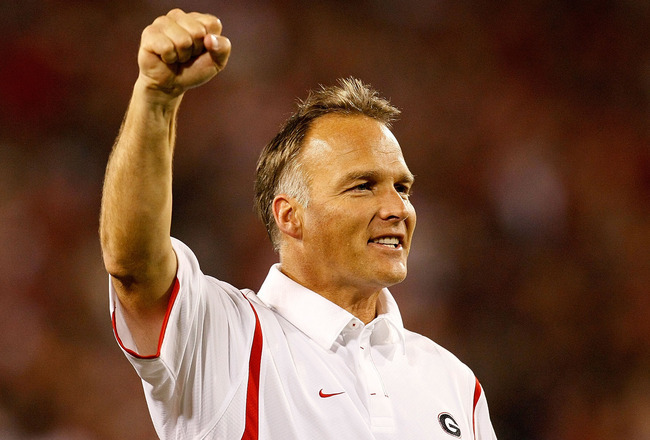 Richt has been at Georgia since 2001 and has led Georgia to two SEC Championships, three BCS Bowls, and five SEC East Division Titles (meaning he’s matched USC’s best season five times and exceeded it three times). And his teams play with passion and a chip on their shoulders. Ask the 2007 Florida Gators. The Tim Tebow led defending national champion Florida Gators, who never recovered when the entire team rushed the field at coach’s order to celebrate an early touchdown. But Richt is not married to his job. He has a wife who has battled and defeated cancer and four kids (two of which were adopted). Richt believes in doing everything as if he’s doing it for the Lord (Colossians 3:23). And he is able to invest in 25 players a year, multiple trainers, managers, and staff, along with their families. And this is an opportunity he takes seriously. And while some players haven’t taken advantage of that opportunity, many have. And anyone that can succeed the way he has, carried himself the way he has, and represented the University the way he has earns my respect. Even if I hate them. Tanner has taken the entire USC athletic department to heights never achieved by men (there is that one other national championship in women’s equestrian, if you want to count that). Even before the back-to-back championships, Tanner made himself king of Columbia. 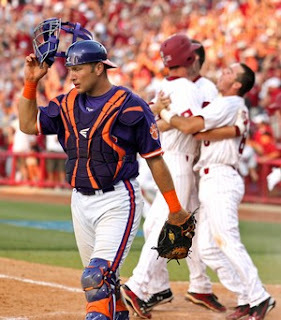 Most notably in 2002 when USC defeated Clemson twice in Omaha on their way to a runner-up finish. Again, it isn’t just the success with Tanner, but also the way his teams play. The players are loose, have fun, and he’s not afraid to gamble. He knows his players, which buttons to push, when to get in their faces and when to get out of the way. And they never give up. This is never more apparent than when Clemson & USC do battle. One dugout is thinking while the other is playing. One dugout relaxed. The other nervous. Just as one coach is loose while the other is uptight. And recent history puts the advantage on the chill side. And I hate to say it nearly as much as I hate USC, but truth prevails. And it hurts. And because of this truth, USC is earning my respect one hustle play and win at a time. 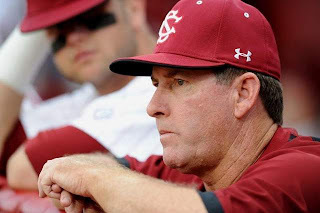 So – now that my two main rivals have coaches with that are garnering my respect, does that mean I am pulling for them? No. H#$% No! I still hope they lose every game. But I don’t take as much joy in the losses while each win earns a little more respect. While watching the US Open, I wondered if southern golf is taking over the PGA Tour. After doing some research, the below post came about. And Clemson's impact on the PGA Tour is a large part of this movement, so enjoy! 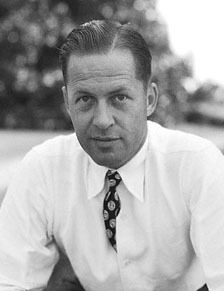 While the South is known for its golf courses (Augusta, Pinehurst, Sawgrass), the game of golf hasn't been focused here since Bobby Jones. Jones pulled the spotlight from Hagan and New York and was able to keep it through most of the 20's and 30's. But following his health issues, it went back to New York with Gene Sarazan. Following Hogan, it could be said Arnie's Army marched the game back to North Carolina. But Arnie had the pleasure of being the first mainstream marketable face in golf. And rather than take the game to North Carolina, it ended up in Times Square. The game rested in the hands of the Big Three and corporate America through the remainder of the 60's, & 70's until their careers wound down. But following their run, golf seemed to struggle (minus one incredible run old man Jack had in '86 at Augusta). It produced great golf, but it could never find its star - someone who could elevate the game the way the earlier greats did. But when the south finally had its grip on the game again, it didn't let go. This time it held on, like a Gator with dinner. During Tiger's run, starting with his win at Augusta in 1997 and ending that fateful night, Americans won 32 major championships (Tiger 14). Of those 32 wins, only 6 were by southerners. The numbers were even worse until Glover (Clemson) and Cink (Georgia Tech) went back to back in the summer of 2009. That 12+ year run saw Tiger and Phil go head-to-head and he rise of Jim Furyk. It was so bad, even the one-hit wonders were Yankees (Beem, Micheel, and Hamilton). But since that night, the South has risen. The majors don't show it (2 to 2, with the last two going to the south), but the regular tour stops do. Using the start of 2010 as the barometer, American's won 72 PGA Tour events (not counting alternate or non-official events). Southerners won 35. And while these numbers only show Southerners winning half the tournaments, the south gets no credit for the vast areas of Texas and Oklahoma. These areas aren't really south, but they ain't north either. If you leave Texas and Oklahoma out, then the South has won nearly twice as many as the other regions. And it's a different breed of golfer. They're young, brash, and, most importantly, themselves. You've got Watson's power and quirkiness, Dufner's chill, Dustin Johnson's length, Kuchar's smile, and Haas' lineage. The accolades for Stoney Brook and Kent State rolled in. From conference friends and foes to rivals of Miami, LSU, Purdue, Oregon, and the rest of the College World Series field. A modern day Cinderella is still a sight to behold. We love the enthusiasm, joy, and passion for which they play the game - seeing them go farther than even their dreams would allow. And we hope midnight never comes. But like every love story, someone will be disappointed. Only the bride lives happily ever after. We forget about all the other girls who have one less friend who understands their struggle. So amidst the celebration is a slight tinge of jealousy. We look at Cinderella and tell ourselves we are prettier than her, dress better, bring more to the table, and have a better lineage. And we promise ourselves the next great love story will be our own. I mean, if she can do it, so can we. And it seems the reality of sport is like the unmarried side of a love story. We celebrate Cinderella, cheer for them, and hope they take down the favorite. And amidst that celebration is a tinge of jealousy. We tell ourselves we have better coaches, players, facilities, and fans. We have a great history and even better future and there is no reason the next sport celebration shouldn't be about us. And the expectations rise. The barometer of success changes. What was formerly a good season now becomes failure. Fans begin losing interest and improvements can't come fast enough. To expedite the process, facilities are improved and coaches are hired and fired. Next year, when college baseball starts, every small school will look to Stoney Brook and Kent State and say that could be us. And every large school will say that better be us. And this fall, when the college basketball season starts, every small school will look to Butler, VCU, & George Mason and say that could be us. And every large school will say that better be us. And this fall, when NHL teams return to training camp, every team will look to the LA Kings, the 8th seed, and say that could be us. And as the dog days of summer continue, every major league baseball team is looking to the St. Louis Cardinals, telling themselves that could be us. Well, at least there is still one dance where Cinderella is not invited. Clemson is a special place. A place we hold dear. Not because of the University and what it has or will accomplish. Not for what it has allowed us to accomplish. Not for its beauty, academics, or athletics. We hold Clemson dear because we can’t separate ourselves from it. It has become part of us. It's who we are and always will be. And this blog wants to celebrate and share those memories. For some of us, there is no start to those memories as they begin at birth, as we are not the first generation to hold it dear. For others, they begin on move-in day when we unpack for college and say goodbye to mom and dad. And for others, it’s not until we are surrounded by 80,000 fans as we experience our first game at Death Valley. But regardless of when those memories began, we all have them. And we all have stories. Some funny, some sweet. Some silly and some life-changing. 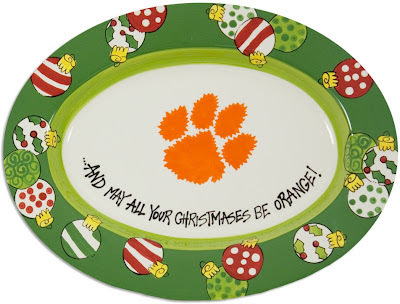 And each story is unique, minus one common bond: Clemson. And this is a place where those stories can be shared and celebrated. So please email those stories to us, along with a subject line for sorting, and any photos, and we’ll share them with other like-minded Clemson fans who want to celebrate with you. You can connect with us through the "Your Story" Page or the "Contact" Page. The baseball season started and ended the same way – with a loss. The first one didn’t hurt all that much, but the last one did. The first one launched the season, with ideas of grandeur and Omaha. The last one brought reality and finality. And with the season concluded, the time has come to look back, see what went right and what failed. See what we did well and how we could’ve improved. And at the end, we’ll give out some awards and offer a few words of advice. 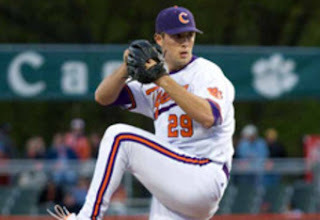 Clemson opened the 2012 season with a consensus Top 25 national ranking, the preseason pick to win the Atlantic Division, two returning All-ACC performers, the majority of the pitching rotation, and a hunger to advance farther than last year. But Clemson never found a rhythm and was a bit inconsistent. They finished 3rd in the Atlantic Division, a little above 0.500, and bowed out of both the ACC Tournament and the Columbia, SC Regional without any hardware. And when a team fails to meet preseason expectations, it’s hard to deem the season a success. There were successful moments (FSU & Miami), but as a whole, I think most Tiger fans are left with somewhat of a disappointing feeling. But, anytime you play 60 games against top-notch competition, there are going to positive moments. At the beginning of the season, all three outfield positions needed to be replaced, with few known answers. One solid answer: Thomas Brittle. The transfer from the College of Charleston was fantastic in center and solid at the plate. Brad Felder snapped up the right field spot and had some huge hits. Another positive: Clemson in big games. A few times this year, Clemson had their backs against the wall. Each time, they came out swinging. Series wings against Miami, Georgia Tech, & Florida State were indicators this team was capable of being competitive against any team in the country as did close series and regional losses to USC. The numbers show the team having decent pitching and hitting statistics. And they were, but they’re a little misleading. Clemson was never able to put everything together all for an elongated period. It seemed that nights when the pitching was solid, the bats never showed up. And on nights when the bats came to play, the pitching didn’t. The result: 6-11 record in 1-run games (0-3 in post-season play). This is best seen on Fridays when Clemson went just 7-7 and helps to explain why ace Kevin Brady had a fantastic era (2.54), but went just 1-3 with 8 no-decisions. The Tigers were close – only a few runs away (whether it be scoring a more or giving up less) from having a solid season, hosting a regional, and still playing. They went 26-8 when scoring 5 or more runs and 21-8 when giving up less than that. The problem: Clemson played 59 games, which means they scored 5 or more runs just over half the time and gave up 5 or less right half the time. The other negative is perception. This team lost some games this year it either never should have, such as Maine, Western Carolina, Presbyterian, and College of Charleston (first ever loss to C of C). Additionally, this team was swept in three ACC series and lost 4 out of 5 against USC, with the final two ending their season. 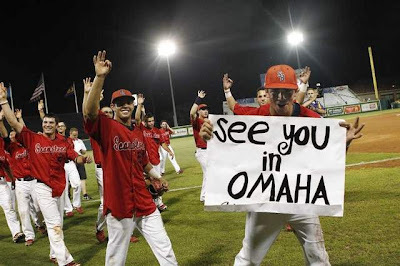 Considering the season’s expectations, along with Clemson’s annual goal of getting to Omaha, it’s hard to deem the season a success. Most people weren’t thinking National Title, but were at least hoping to exceed last year’s squad. The Tigers equaled last year by losing in the regional, but unlike last year, this team wasn’t poised to advance through the Regional and head to the Supers. 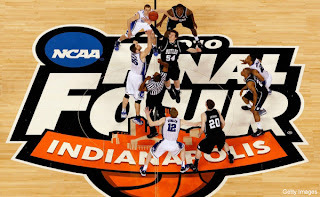 This team, and the fans, seemed resigned to the fact that making the tournament was as far as the team could advance. Is there any one play or game that would’ve changed the direction of this team? Not sure. Maybe the first USC game from Charleston. But this team felt more like a Bowden football team than a Leggett baseball team. They never seemed to be able to build on any momentum and were pretty inconsistent, both of which are atypical of Leggett teams. Unfortunately, next year may be a step back as graduation and the draft take a toll. The majority of offensive production will be gone (Shaffer, Pohl, Brittle, Kieboom, Felder, Stolz) as well as two weekend starters (Brady & Leone). Clemson will need to find some bats – and find some in a hurry. Also, Kieboom has been a stalwart behind the plate and those will be big shoes to fill. The good news is the young pitchers really stepped up. Gossett looked fantastic toward the end of the year and Pohle kept getting better and better, earning a spot in the weekend rotation. So while this year was not what we hoped or expected, it wasn’t a failure either. 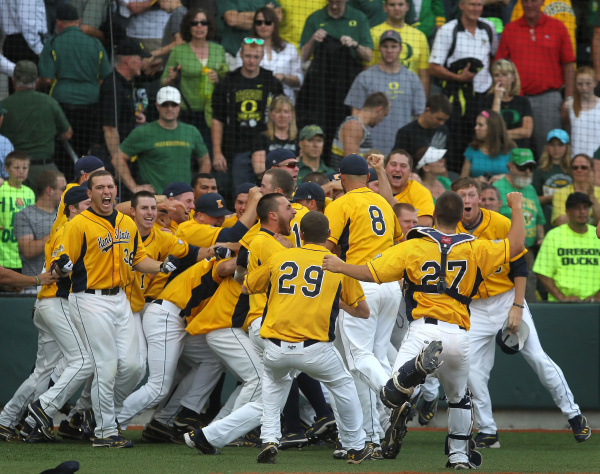 College baseball continues to get more and more competitive, so making the tournament is always an accomplishment. But at the same time, just making the tournament is not the litmus test for this program, Omaha is. And anytime you don’t achieve that goal, you feel unfulfilled. And that’s how the majority of the fans feel. And that’s not a bad thing. College Baseball reminds me of Christmas. For many, Christmas is over before the end of Christmas Day. We swap presents, have a meal, hang out with family. Then we go home. And all we're left with is the mess. The tree to tear down. The lights to put away. The decorations and china and silly clothes to pack up and put back in the attic. The credit cards to pay. Then, a few days later, after the house is back together, we begin to think back to Christmas. The presents we received, the food we ate, the family we saw. We ponder "whether it was good or bad". We remember the parts we enjoyed. And try to forget the rest. And the same holds true for college baseball. Baseball is the last of the collegiate team sports to finish, so when it ends, so does the collegiate sports calendar. We then lament the end of the season by playing the woulda, coulda, shoulda game. We try to justify to ourselves the end isn't actually here. But it is. And it hits us hard. We realize there are no more Clemson teams to cheer for. No more chances for glory. No more opportunities to gain bragging rights. But slowly we come out of the haze, push through the denial, and look around. Only to see the mess the sports year left us. We begin to cipher through it and ponder "whether it was good or bad". We remember the parts we enjoyed. And try to forget the rest. And that's what we'll do here. 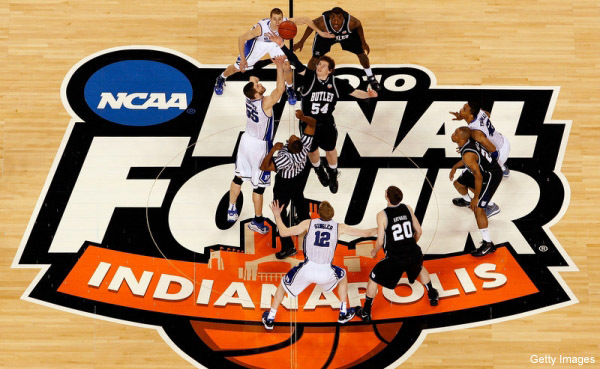 Over the next few weeks, we'll clean up the mess that was the 2011-2012 season. We'll ponder it and discuss whether it was good or bad. We'll celebrate the best parts and figure out what went wrong during the worst. And this season provided opportunities for both. And we'll remind ourselves that two of the best things about Christmas are it comes every year and each year brings new surprises - and disappointments. When I first penned the Preview of the Columbia Regional, I figured it would be a similar story to the ACC Tournament. Close games, maybe one big burst of bats, decent pitching, but ultimately running out of gas. For the most part I was right. The bats did come out to play (thank you Messieurs Pohl & Felder). The final three games were close (combined 4-run margin of victories). The pitching was actually great (team ERA just over 3). But we never ran out of gas, only outs. And for once, I wish I were wrong. I wish I were writing this with Clemson preparing to host the Charlottesville winner. Or at least preparing for a do-or-die game against USC tonight. But we lost. And because of this, I’m writing a summary of events. Not a preview of what’s next. So – let’s take a look at the regional. Not so much what could’ve been, but what was. Let’s do the ole Good, Bad, & Ugly and I’ll give a few final thoughts at the end. For a team which had little to gain and much to lose, USC lost nothing, including games. They kept their streak intact, and even added a few more Clemson notches to their belt. Take Friday night’s game. For six innings, no one got a hit. Literally. And the pressure was beginning to build to see who would crack first. But USC never did. And when Manhattan cracked the door ever so slightly, USC knocked the door down and took control. On Saturday, the same deal. Clemson had a few chances early, but USC didn’t change, only plodded ahead. And the first mistake Gossett made, Matthews deposited to left. Late in the game, when they were down two, they could’ve let the pressure get to them, but they didn’t. They scrapped and ultimately won in extras. As for Sunday, they were on cruise control from the beginning. But sometimes this can cause you to relax too much. They didn’t and held on in the end. Other than a rough start from Haseldon, there is little a Tiger fan could complain about. Gossett and Leone were fantastic and Meyer’s relief role was nearly perfect. From the effort standpoint, the Tigers could’ve cashed it in after losing the extra inning heartbreaker. Noon start in the hot sun with USC waiting in the shadows. But they didn’t. They played well. Played hard. And won a tight game against Coastal and nearly won against USC in their elimination game. Looking at defensive stats doesn’t help much - only one unearned run. But three of USC’ four runs on Sunday came as the result of defensive errors. The first inning could’ve been over with only one run allowed and the lone run in the sixth occurred following an error. If those plays are made, then Sunday becomes a different game. Additionally, Clemson took too many called third strikes and did not bunt well. 2-3 runners were lost due to poor bunt attempts or not moving over runners. When your offensive game depends on moving runners, you better do it well. And Clemson didn’t. Coastal boasted a Top 5 team ERA and two of the top hitters in the nation. And getting behind early makes life tough, especially in post-season play. The interference call early in the Saturday game is the white elephant, but Clemson made 3-4 other uncharacteristic mistakes on the base paths. 4 total hits and one unearned run. All together, the pitching in Columbia was unbelievable, but the Jaspers should’ve been able to muster more than this. If they got anything going on Friday night against USC, the pressure would’ve really been on USC. But they didn’t, and just ran out of gas in the end. The Armpit put on a great regional. The games were entertaining, but in the end predictable. The teams finished in their seeded order. But for Clemson’s sake, they did more than I thought they would. They played hard, didn’t give up, and had chances to win both games. But they didn’t. And their season is over. They have questions to answer. Meanwhile, their rival continues to play. I just wish I were a little more wrong, this time.